← What is “Hitting the wall” and how to avoid it? The term Latte Art is nowadays part of the common thing. The last few years the term became trending and videos of baristas showing their skills emerged everywhere on the internet. From a layered latte macchiato to the well-known cappuccino. It gave the ordinary cappuccino a personality, a signature of the barista who created it. From a heart all the way to sketched portraits. 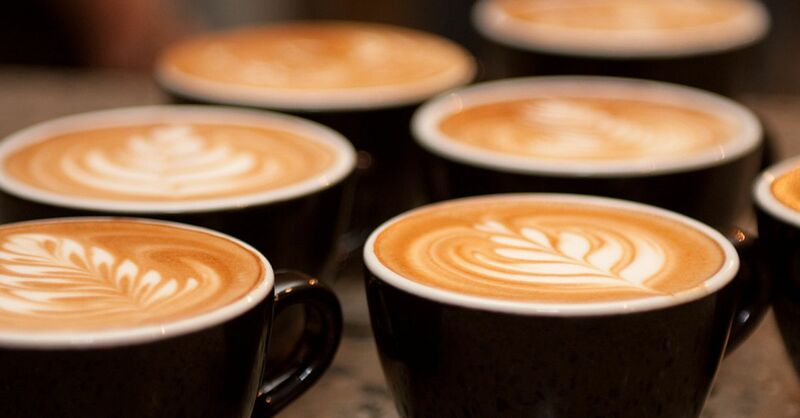 But why is it so important for a barista to learn and master this craft? When people are out for coffee, they expect a good quality cup of coffee. But it is the total experience, sitting on a terrace and enjoying the weather while having a drink. When the cappuccino they order comes with nice art on it, it will enforce the total experience and they are more likely to come back. The latte art also enhance a better taste of cappuccino. Instead of having just a milky foam on top of it, it now has a blend of milk with coffee and is not that boring anymore. For frothing milk, creating the milk foam from liquid milk, it is important to use full and cooled milk. Full milk has a higher fat percentage and is therefore more usable to create a uniform foam. For frothing milk most coffee shops use a steam pipe, which is blowing hot steam through the coffee. Making the milk warm and inserting air. That is why we use cold milk, because it can reach maximum growing before the milks starts to burn. After the milk is frothed, it is time to roll it. By rolling it, the foam starts to mix with the milk underneath, creating a crème. The video below will explain the full process. When you mastered milk frothing, it is time to create ‘Latte Art’. Creating a heart is the start, the most basic figure. When pouring the crème into a latte art it is very important to understand how your espresso shot behaves to the crème. It is all about how to manipulate the dark crema layer of your espresso. When you pour from a bigger height, the crème (milk) will go underneath the crema layer (dark lid of the espresso). When getting closer to the cup the crème will start to layer on top of the crema layer, creating a white and dark contrast. Speed is also an important aspect, if you pour faster, the crème will go underneath the crema layer and vice versa. The video below shows how to pour a heart and explains everything about pouring the milk. Etching actually means drawing. When etching in a cappuccino, you draw on the crème with the dark crema layer. Using a special pen with little ridges that hold the coffee or the foam from the crema. Barista’s draw various things, from a little bear to the entire galaxy. Sometimes chocolate syrup is used to create another layer of darkness and taste in the coffee. With the syrup you are able to create a whole bunch of new figures, like the rose shown in the picture. Most of the etch pencils are expensive and not worth the money, I bought mine here. It was less than a euro and works very well too. If you don’t want to combine a strong chocolate flavour with you cappuccino, you can create one yourself using espresso. Mix the espresso with chocolate powder till it starts to thicken up. 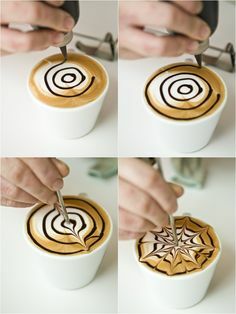 Now you know the basics of latte art, it is up to you to create your own signature. You will probably not succeed in one go, but don’t give up and practice as much as possible.